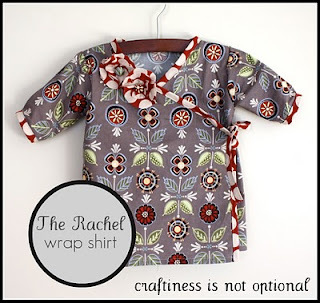 Last week, Jess from Craftiness is Not Optional hosted a sew-along for the Rachel wrap shirt. Of course I had to participate cause I like Jess and the free sewing lessons. I did my sleeves a little different. I wanted more of an Asian inspired look, so I did long wide sleeves. I also used yo-yo's for my flowers. They hold up really well in the wash. If you want to make one too, go HERE for part one. Do you feel bad for my little model? She really wants her binky. Oh bless i want to give her a cuddle!! !